The Squat Pose, or Malasana is a challenging pose that opens the hips, knees and ankles. Western men often find this pose less accessible than women. Around the world this pose is used with ease, in the fields and in restrooms. Maybe our western civilization is missing something? Practicing Yin Yoga invites you to be content enough to relax and soften into the experience, instead of efforting too much. This may be difficult in this particular pose, but noticing where you can modify a bit here and there should make this pose more accessible to you. The Squat Pose is a very grounding pose, energizing your core, your hips, knees and ankles, for a 2nd chakra renewing experience. To set up the pose, come to standing position, with your feet hip-width apart. Squat down and place your hands on the ground. Assess your knees. If they hurt, or if you have knee problems, avoid this pose altogether. Now bring your hands to the front of your chest and into the prayer position as shown. 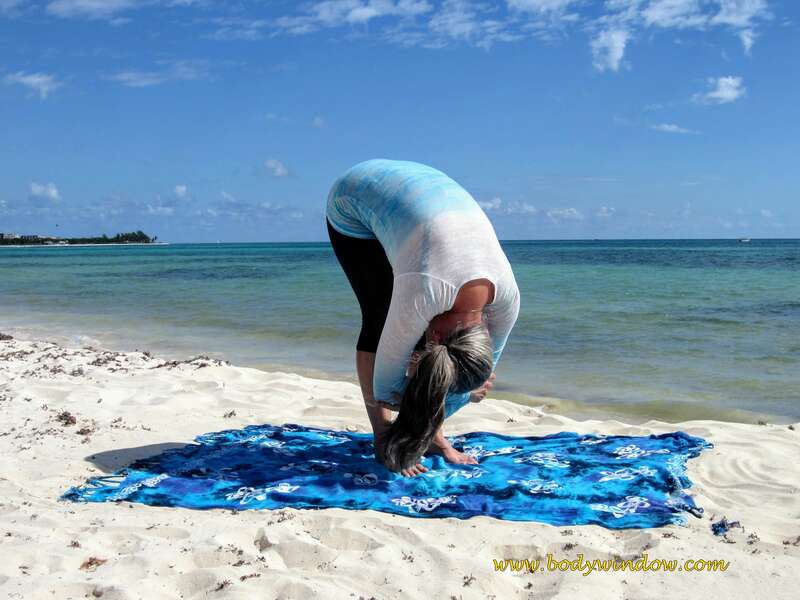 Apply gentle pressure from your elbows into your knees to solidify and ground the pose. If this maneuver is too intense for your hips, just relax your elbows on the front of your knees. If when squatting, your heels cannot touch the ground, place a rolled up mat or blanket under your heels. You may also play with the position of your legs, widen or narrow them to see if this feels more comfortable. You may also try to do this pose up against a wall for more support if needed. Some like to turn the feet out, and others like to keep the toes pointing forward, depending how their hips feel in the pose. I am most comfortable with my feet at a 45 degree angle as shown in both photos. Find your own feet/hip position that is most comfortable to you. The key to the Squat Pose is indeed to soften your body, and relax and release into this pose for its full effects. As you hold the pose, the sensation of your hips sinking closer the ground should be felt. As your hips sink, perhaps your chest will rise. Notice the subtle shifting of your body as it releases and you adjust your balance to hold a place of contentment. Breathing and noticing is a healing contemplative and meditative practice for all. Once you have settled into the Pose for 2-3 minutes, breathing deeply down and into your belly, you may chose to do a twist here. Take your left hand and place it on the ground in front of your left foot. With your left elbow pushing firmly into the inside of your knee, twist your torso to the right, as you raise your right arm, reaching for the sky as shown, below. Hold this twist for 10 breaths, or a minute or so. With each inhale try to twist just a millimeter more. Untwist, and repeat on the other side. This pose feels particular nice when you actively stand back up from the squat, then immediately go into the Dangling Pose. As you do the above sequence, place your hands on the ground between poses and adjust the position of your feet and legs as needed when you switch. May you always release any unconscious resistances that you may have when you practice the Squat Pose to you heal your own body-mind-soul. May you always strive to be content when you soften your body, mind and heart!